Prepare – Deutsche Neurowissenschaften-Olympiade e.V. The Neuroscience of the Brain, a booklet published by the International Brain Research Organization and available for free download by clicking here for the full version in English (German translation, for reference use only). 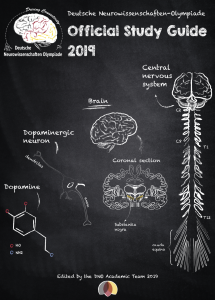 The second resource, our new 2019 Official Study Guide, is compiled and published by the Deutsche Neurowissenschaften-Olympiade e.V. The guide is password protected and only available to our competition participants. 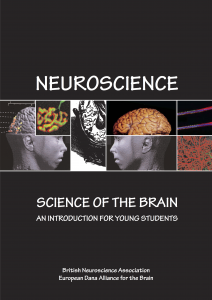 Inside this official study guide, additional information on which brain structures are included in the Neuroanatomy Section of the event (along with diagrams of each structure), which neurological diseases are included in the Patient Diagnosis Section (along with information about each disease), and other helpful tips for preparing for the competition can be found. All 2019 Regional competition questions will be based on the 2018 Official Study Guide. The 2019 Official Study Guide will be used for the 2019 Nationals event taking place in Frankfurt, Germany. Our DNO e.V. Academic Team is very proud to present our updated 2019 study guide! Improvements in overall formatting as well as language and readability. New info-boxes containing interesting information about the material presented in each chapter. Content changes in chapter 2: Development of the Nervous System. Improved descriptions regrading the communication between neurons (ion channels, membrane potentials, synaptic communication) in chapter 3: Development of the Nervous System. Do you want to to participate in our next Neuroscience Olympiade? Test your knowledge by answering a few test questions. Approximately how many neurons does the brain contain? The biological clock is located in what part of the brain? Name the device that measures brain waves.